What do you call one ant running away with another ant? Antelope! With spring rolling in, so are the bugs! Ants are marching in full force in Minneapolis, MN and it’s time to put a stop to them! No matter what do-it-yourself method you may try in your home, it can be almost impossible to get rid of these little critters! Like the joke said, our professional ant exterminators know just how to make these ants run for cover — and outside of your home! Here at Eco Tech, we are ready to get the job done right, the first time! 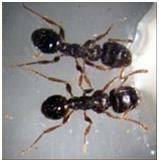 Eco Tech is an integrated pest management service that offers organic ant control services. With over 15 years of pest removal experience, we are here to help you get the ants out and regain control over your household. We offer effective, organic solutions so that your children, pets, and any other animals around are left unharmed during the ant removal process. We pride ourselves in being honest, reliable, on-time, and friendly! For this reason, we require no contracts for our services and provide some of the lowest prices in the industry! We are so confident in our professionals and our product, we offer a four-year service warranty on all of our pest control plans. Ants can be some of the worst pests to deal with! Their colonies can reach up to 500,000 in number, grossing out your average homeowner and stressing out your family budget. Not to worry, we are here to help! Ants can invade your home through the tiniest of cracks or holes. They typically are seeking sweet or greasy foods, so trying to keep messes to a minimum can greatly help any ant problem. If you find ants in your home, the best way to get rid of them is finding an exterminator that can locate the nest location and eliminate all of the ants. Fortunately for you, we have the right professionals for any ant job! Our exterminators can locate the nest and tell the difference in ant species, which can make a huge difference in how we treat it. We are well trained in figuring out the problem and provide a less toxic, organic solution that will keep everyone else in your home safe! So if you live in Minneapolis, MN and find yourself with a big ant problem, don’t count on them running away with one another! Call Eco Tech today at 763.785.1414 for all of your ant extermination needs!